You’ve arrived at the best hotel in Orange Beach, Alabama. Plop down in a beach chair under the umbrella, that’s what. 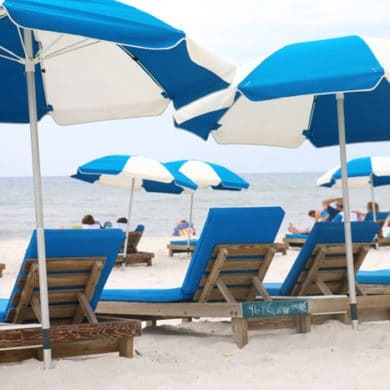 The Best Western Premier Tides Hotel Orange Beach is proud to partner with Perdido Beach Service to offer more than lounge chairs and umbrellas. Owner Ted Scarritt has been serving this community for more than 20 years. At Tides Hotel, Perdido Beach Service will offer rentals of chaise lounges and umbrellas, folding chairs, stand-up paddle boards and kayaks. They’ve even set up a beach volleyball net on the shores beyond our back door. Debbie says the beach attendants set Perdido Beach Service apart. They offer polite, friendly service while responding quickly to the requests and needs of customers. They also keep the beach beautiful for residents and visitors, picking up trash by hand, raking seaweed and renourishing the dunes. If you’re interested in setting out to sea, the owner of Perdido Beach Service also owns Sail Wild Hearts, a 53-foot open-ocean catamaran. Sounds like a reason to celebrate. When you visit us at The Tides Hotel Orange Beach, every day is worth celebrating. And Perdido Beach Service can help make moments to remember. To learn more, just ask a beach attendant. Visit the Perdido Beach Service website or call (251) 981-4807.